We woke to grey skies and falling rain, not the bracing cold blue skies we’d been promised a few days earlier. Not only that, by the time we were putting up the gazebo to house the refreshment tables, the wind was getting up too, bringing in further showers and threatening the stability of the gazebo’s frame. However, come 11 o’clock a blue sky provided a beautiful backdrop to the photos taken at the start, and no-one would believe the wet and cold of an hour earlier – except those setting out the course! The Grand Old Duke of York marched his men up to the top of the hill, and then down again (pointlessly, we’re led to believe! ), whereas a record number of runners chose to do likewise, all in the name of sport. Some 236 in fact (mental note to ensure we increase the number of doughnuts next year). Whereas usually we encounter mud as we come off the Ambrey and then again on the first steep slope into the woods, this year there was mud beyond the pond, mud at the top of the first field, mud on the approach to the Ambrey, as well as the inevitable mud coming off the top, hence the slightly slower times many achieved (useful excuse, especially if you have other reasons for being slower!). 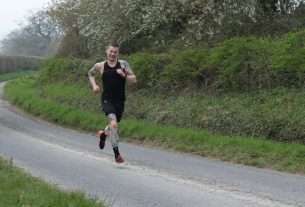 The men knew from the outset they’d be operating in the shadow of the women’s performance (1st, 3rd, 4th, 6th, 9th, 23rd, 27th and 29th), but Mark Thomas gave a fine performance to lead Croft home in 12th just pipped by former Croft runner, Sam Mayglothling. Then there was big gap, with numerous Croft runners unavailable, to Glyn in 33rd, Matt 35th, and Justin in 38th – well done all three! Nigel T, returning from a lay-off fought well for 49th place. Paul C-D was 59th, running well over the second half of the race, and Ashley just beat Ian in the over 65 competition. Neil was the 5th Taylor to cross the line (not quite enough Taylors for Dorothy Sayers), with Simon Baker running his first race for Croft in a very creditable 72nd place. Further down the field were Brian D ( having raced round the course 102 times since its inception) and brother Tom (perhaps on 99?). 127 men completed the course, and also 5 juniors (including Sam Roberts and Jasper) who ran the shortened women’s course. As Mike points out, there were more Croft women running than men – a first, and the evidence is in the team results, which involved 8 women’s teams. sums it all up nicely!